Imagine your child has the skills to be perfectly focused on whatever they are doing while simultaneously being completely relaxed. Imagine your child has the fitness, balance, and muscle tone they need to do whatever they love. Imagine your child is totally free of anxiety and excessive fears. Imagine your child feels safe and loved at all times and has the self confidence to tackle anything. 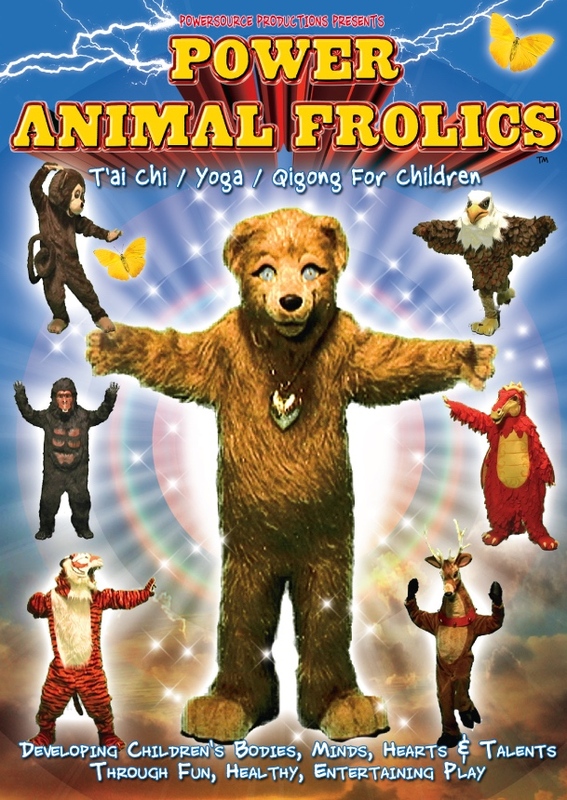 Just like the waters of a powerful river or flood sweep everything out of their path, the CHI or energy generated by the animal frolics--the first qigong practice ever created (over 2000 years ago)--washes away obstacles to vibrant health, inner peace, constant love, and joyful living. Just like a smooth, steady flow of water will clear out a clogged up pipe or smooth a rough stone, a steady of flow of CHI pulsating through our bodies keeps our arteries, veins, capillaries, and energy channels open while smoothing and soothing our emotional body. Animal frolicking teaches us how to be and respond appropriately from a calm center in all circumstances. Sometimes we're as soft as a light morning mist or as gentle as a snowflake. Then there are times we need to be as hard as hail or as powerful as an avalanche. For thousands of years the Chinese have been using the simple exercises, focused breathing, and internal focus and concentration of Animal frolicking to achieve TOTAL health-physical, mental, and emotional. improve concentration, focus, performance, physical and emotional balance. reduce blood pressure, anxiety and depression. improve reactions to stressful situations. improve overall health by enhancing the immune system. Improved blood glucose levels, weight loss, stronger immune system, better sleep, and more energy were among the benefits noted in the British Journal of Sports Medicine. Each of the various animal exercises has specific as well as overall benefits for your child! As your child soars like an Eagle, they develop balance, lightness, and agility. They cool and relax their whole body, balance their heart-energy, gently stretch their ligaments and release tightness in their spine. Eagle exercises help instill confidence, freedom and grace. The squatting, flying, stretching of legs and arms, strutting, balancing, controlled walking, keen focus, coordination of arms and legs together, and heart-centered resting of this frolic will truly enhance your child's Eagle Heart and much more! Pretending to be a Bear will help your child develop deep-rooted power. Bear frolicking helps create greater leg strength, strengthen the spleen and lower back, fortify the bones, and develop energy in the kidneys, which are the body's fundamental source of vitality. They naturally teach your child to go within, stay centered and keep their inner priorities as they go through the world. Taking on the persona of a bear-methodical, grounded, yet full of energy inside ready to burst into action at any moment, helps prepare your child for anything and everything. Frolicking like monkeys helps develop your child's suppleness and agility. It helps them become quick witted, alert, and nimble. Monkey frolics help remove blockages in the flow of blood and chi. They help prevent and harmonize hardening of the arteries. They help to clear plaque also. They loosen their body and joints. They sharpen their eyes and improve hearing. Deer frolics help your child develop grace, eloquence, precision and relaxation. They engender fluidity of movement and consciousness. They open up creative channels. They give a long stretch to the legs and spine, creating an open, expansive movement with very flexible muscles and bones. They benefit the liver and lower abdomen and open the area between the mid back and atlas. They strengthen the bones, joints, hips and knees. Tiger frolicking is like a powerful hurricane wind in movement and like a tranquil evening moon in stillness. Tiger exercises help develop your child's muscular strength. They strengthen the waist, muscles, lungs and kidneys. They build courage, internal power and will power. They help prevent winter colds. While the chi or energy of Bear frolicking works on the bones (our core energy), Tiger frolicking works on the flowering of the chi into muscles, tendons and skin. Hand and finger strength are improved along with focus and concentration. Frolicking like a powerful, yet graceful, Dragon strengthens the kidneys. Twisting, bending and flowing like a swimming dragon stimulates your child's endocrine system while working on the organs, muscles and skin. As your child moves like a swimming Dragon, they create elasticity in their body, make their skin beautiful and help their body utilize food. Stretching, shaking, and twisting their body like a swimming Dragon opens up capillaries and causes increased oxygenation and energy. These beautiful and oh, so graceful movements open the two main energy channels in your child's body. Moving like a Gorilla can help heal oneself from illness, keep the body healthy and develop a strong body. Gorilla frolics stimulate all the organs and energy channels of the body and help focus the mind through a rhythmic patting of the body. They circulate the blood and send energy from the outer most layer of the skin through the body deep into the organs, vessels and bone marrow. From using patting to prevent a lack of oxygen and retardation in an infant, to a mother patting a child on the back or stomach when it is in discomfort, to lightly patting it to help it sleep, patting as a method of healing runs throughout our lives. Becoming Gorilla in play will help make your child strong and tough on the outside and smooth and flowing on the inside. Gorilla frolicking strengthens the lungs, sinuses, and throat while generating a tremendous amount of energy, strength, and feelings of well being. Gift Your Family With This Treasure!